I have recently started to develop and test a program that I have been operating manually for the past four to five years. This was a program that was ran through an excel document and require long hours of recording data for players. I have referred to this style of practice as “measured practice” in the past, so hints the name Measured Practice. This program is still under a testing phase, but will be ready for release mid 2016. Measured Practice™ improves your game by showing which shots are costing you the most strokes on and off the course. This allows you to focus your efforts on the areas that will provide the most improvement. Measured Practice™ uses one metric that averages the number of strokes to hole out from each lie and distance. The values are calculated using strokes or sometimes fractions of a stroke that add up at the end of a round or practice session. The baseline has been estimated for a player who would shoot even par and your skills will be evaluated off of this baseline. This website is optimized for use with your smart phone, but will work great on your PC or tablet. Research shows that practicing in a manner that creates accountability and consequence is one of the most effective forms of practice. 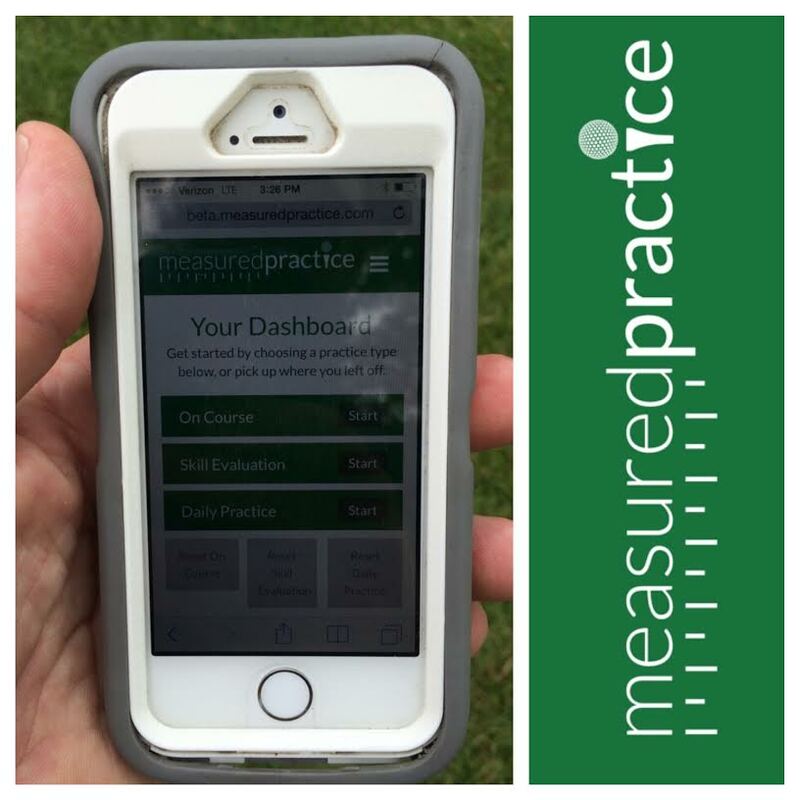 Incorporating Measured Practice™ into your practice will help you develop that accountability and allow you to take your skills from the practice area to the course. Additionally, successfully transferring your skills to on-course performance requires actual practice in the environment. This means that practice sessions have three key elements: they are completed on course, have accountability, and are randomized. These three key elements are what Measured PracticeTM is all about. Adding Measured PracticeTM to your training will help you understand, on a deeper level, where your technical skill bases or mental focus training should be concentrated. Players ask all the time how to you take what they are working on at the practice facility to the golf course. The answer is, how you practice and the environment you practice in. Practicing a skill with repetition can have great benefit to building a more consistent motion, but there is no substitute for hitting shots in the actual environment and learning to adapt to the lie and situation. Players spend quit a bit of time hitting the same shot multiple times in their practice sessions and then go to the course and they have to hit one shot, one time. As you can know this is a difficult task, so practice sessions that also include shots that are on course or one at a time and then change positions or targets will help you preform while you are playing. While at the practice facility I would also try to play the holes at Skokie on the course, meaning hit your drive, then hit the next club you would typically need, and so forth until you get to the green. Play all 18 holes one the range in this fashion to help randomize your practice sessions. Practice that simulates playing will help you calm your nerves and also help you take your skill to the course faster. Players need to practice smarter, not always harder. One of the best ways to retool your swing on the range is to work on hitting full shots slow motion, around 50% speed, to feel the changes you are working on and allow the pattern to take hold. As you can accomplish the positions or change at a slower speed then speed up the swings to help develop confidence in the new motion. The image above has two types of practices stations setup, Purposeful practice and Chaos practice. I encourage my students to have a goal when they go to the range, no matter their handicap. Setup your practice station in stacks of 5 balls, whenever you finish a stack of balls slightly speed up the motion as you go through the stack of balls to eventually be at full speed. Repeat the process and you should have a better chance of making some of the changes you are working on. Remember, practice with a Purpose and not with Chaos. Mirror: Watching your body and club move in a mirror will help you make changes and place yourself into the correct positions you are trying to obtain. Alignment Sticks: If aligning your body to the target is difficult for you, then use an alignment stick (driveway markers) to help you get the proper feel for alignment. Towel: If distance control in putting is difficult, you could hold a towel under your biceps while putting. This would help you control the speed of the putter with your torso, rather than your arms and hands. There are several feedback drills that can fit your specific golf needs. These are just a few random examples to give you an idea of what a feedback drill looks like. Not only is this a more effective way to practice, but creates a game like atmosphere and will make your sessions more fun and challenging. If you will take the time to practice in this manner your odds go up significantly over time to help learn or reprogram your current skills.